The purpose of adding interactivity to eLearning has been two-fold, improved learner engagement and better learning outcomes. While we are able to gain basic insights on learner engagement, learning outcomes still deserve to be judged well. And, this very need demands further channelization of interactive learning analytics. How about retrieving data that could help in analyzing learner behavior and learning patterns? Alternatively, knowing which interactivity is working great and returning high-end results? Or, how about retrieving key statistics to know how engaged your learners are? Behold and make way for "Engagement Analytics" in eLearning. Raptivity team paces ahead with the concept of Engagement Analytics to map user behavior and answer the above-mentioned questions. An amazing combination of ‘Data Analytics’ and ‘Interactive Learning’ packs as a firm base for this concept. Engagement Analytics will enable eLearning developers to get sophisticated insights into what’s working in their interactivity, and what’s not. Based on the valuable insights, they could tweak the interactive content to achieve desired learning outcomes. Are my learners visual or they prefer reading content? Do my learners simply gloss over the content or thoroughly go through it? Are my learners missing important content? Do I need to improve instructions to emphasize it further? Mapping learner behavior through analytics would help in efficient and engaging course design. It is all about performance improvement and better learning outcomes here on. 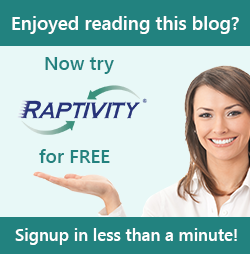 To explore Engagement Analytics in-depth, visit www.raptivity.com/engagement-analytics. Have you done a test drive of this interesting concept? We would love to hear your thoughts on it. Sign Up now to learn more about the benefits of Engagement Analytics in eLearning.